Days after Roche’s cancer immunotherapy Tecentriq won a long sought-after approval in lung cancer, a Wall Street analyst cut sales forecasts for the drug by billions, reflecting the competitive challenge faced by the Swiss pharma in taking on market leader Merck & Co.
Last week, Tecentriq secured an OK from the Food and Drug Administration for previously untreated patients with metastatic non-squamous non-small cell lung cancer (NSCLC), making it the second checkpoint inhibitor behind Merck’s rival Keytruda cleared for use in the first-line lung cancer setting. In theory, the approval should unlock a wider market opportunity for Roche, which has trailed behind Merck and Bristol-Myers Squibb in finding commercial success in immuno-oncology. But Tecentriq’s latecomer status and more modest clinical results will make competing with Keytruda difficult — a reality Cowen analysts acknowledged in reducing their revenue estimates for Roche’s drug by 450 million Swiss francs next year, and $1.2 billion Swiss francs in 2020. Roche had to wait an extra three months, but last Friday the pharma finally secured U.S approval for Tecentriq (atezolizumab) in frontline metastatic lung cancer. 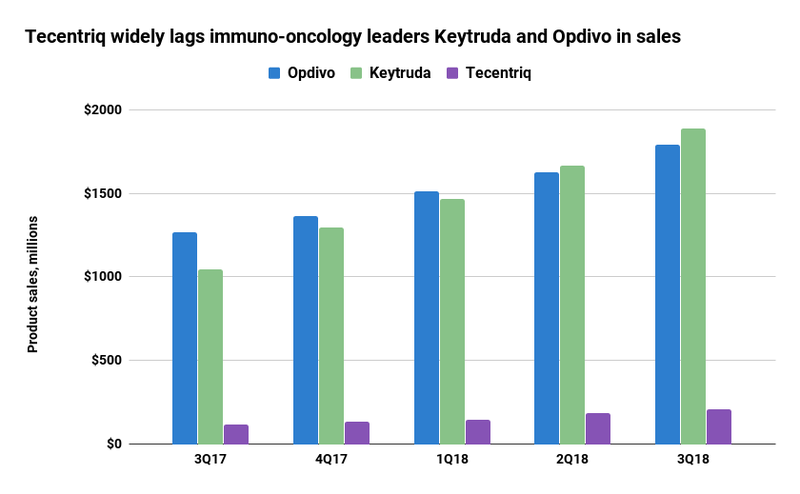 With the OK, Tecentriq will now face off against Merck’s Keytruda (pembrolizumab), which has quickly become the leading immuno-oncology drug following earlier approvals in frontline NSCLC. Replicating Keytruda’s rapid commercial rise will likely be out of reach for Roche, at least in lung cancer, due to the widespread use of Merck’s drug and clinical results that don’t quite match Keytruda’s. Analysts at Cowen, an investment bank, believe those hurdles will be difficult to overcome. The group on Monday reduced sales projections for Tecentriq in lung cancer by $3.2 billion in 2024 — driving an overall lower outlook for Roche’s drug. In IMpower-150, the study that supported Tecentriq’s first-line approval, Roche’s drug combined with Avastin (bevacizumab) and chemotherapy reduced the risk of death by 22% compared to Avastin and chemo alone. Measured in overall survival, patients on the Tecentriq arm lived a median of 19.2 months versus 14.7 months for those in the comparator group. A stronger survival benefit was observed in patients who were positive for the T effector gene. Trials are difficult to compare, given differences in patient characteristics, measurement and control groups. Still, Keytruda’s results in first-line NSCLC are widely seen as class-leading. A study called Keynote-189, for example, showed Keytruda plus a different chemotherapy regimen cut the risk of death by 51% compared to chemo alone, with median overall survival not yet reached for the treatment arm. Merck also holds first-line approvals in NSCLC for Keytruda as monotherapy in patients who express high levels of a biomarker called PD-L1, as well as in combination with chemo for patients with squamous type NSCLC. Roche has also read out data from other studies of Tecentriq with different chemo pairings. But, so far, analysts haven’t been widely impressed. Credit Suisse analyst Vamil Divan found results from a trial called IMpower-130, which compares most closely with Keynote-189, underwhelming. Roche appears to be positioning Tecentriq for subgroups of patients within NSCLC who could benefit more (such as those who are positive for the T effector gene). But the drug’s recent approval excluded patients with EGFR and ALK gene mutations, two groups for which Keytruda isn’t approved for first-line use and Roche had shown Tecentriq to be effective for in IMpower-150. Still, opportunities remain in immuno-oncology. Analysts at Cowen highlighted Tecentriq’s prospects in small cell lung cancer, where Keytruda’s edge is less established, and in colorectal, ovarian and breast cancer.